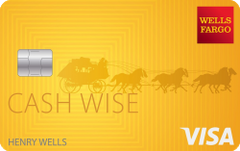 If you’re looking for a basic cash back card to use on general purchases and don’t want to bother with a complicated rewards scheme, the new Wells Fargo Cash Wise Visa Card is a good choice – particularly if you already bank with Wells Fargo and would prefer a card from the same bank. The Cash Wise Visa Card doesn’t offer as many perks as its competitors and is somewhat pricey for cardholders with lower scores. However, the card’s very generous $200 sign-up bonus is an enticing feature for new cardholders and helps make up for the card’s other shortcomings. Also, its limited 12-month promotion offering more cash back for smartphone users is unique, and its single rewards rate for every purchase is appealing for busy cardholders who don’t want the take the time to track bonus categories. Many rewards credit cards make credit card holders work for their rewards earnings by having them keep track of limited or rotating bonus categories. If cardholders don’t purchase something that earns an automatic bonus, they only earn 1 percent cash back or one rewards point on their purchase. The new Wells Fargo Cash Wise Visa Card, by contrast, keeps it simple by offering unlimited 1.5 percent cash back on purchases. The higher rewards rate on general purchases means cardholders can earn a larger amount back without having to worry about rotating bonuses or limited categories. It also allows cardholders who do take the time to track rewards categories to supplement their earnings with 1.5 percent cash back on purchases that don’t qualify for a bonus on other cards. The card’s $200 sign-up bonus is one of the largest bonuses among cash back cards and is a good reason to enroll. Note that there are cards on the market that offer a cash back rate of 2 percent, and – in the long run – would be a better option if you are looking for the highest amount of cash back. However, the bonus on the Cash Wise Visa Card should be a good incentive if you’re on the fence about signing up for this particular card – you’ll find few cash back cards with more generous sign-up offers. The card also offers a unique opportunity for smartphone users to earn 1.8 percent cash back for the card’s first 12 months when they make their purchases through Google Pay or Apple Pay. If you’re a relatively heavy spender and live in an area where a large amount of retailers accept mobile payments, you could potentially earn a significant bonus just by using your phone to make your payments instead of your card. For example, if you spend $1,000 a month on your phone for the card’s first 12 months, you’ll net $216 by the end of the year. Thanks to its higher bonus on general purchases, the Cash Wise Visa Card is a great card to use for all or most of your spending. However, because this card also charges a relatively steep APR (particularly for cardholders with lower scores), you could get yourself into trouble if you spend more than you can afford to repay each month. The lowest available APR on the Cash Wise Visa Card – 16.24 percent – is well below average and is significantly lower than its competitors. However, the card’s maximum APR runs as high as 28.24 percent, which is extremely high for carrying a balance. If you’re offered an APR near the high end for this rewards card, it’s a good idea to only use this card for purchases that you know you can afford to pay off. The good news is that your cash back never expires as long as you keep your account open, so even if you only use your card sparingly, you should still earn a significant amount back. Wells Fargo also makes it easy to claim your cash back once you’re ready for it – as long as you’re already a Wells Fargo bank customer. To redeem your cash online or through an ATM, you must have a Wells Fargo deposit account. Otherwise, Wells Fargo will mail you a check. Unlike many cash back cards, Wells Fargo also allows you to pay down loans with your cash back earnings, which is a nice option for cardholders who want to whittle away debt. The Cash Wise Visa Card is currently offering up to $600 worth of cellphone protection against covered damage and theft (subject to a $25 deductible) to cardholders who use the card to pay their monthly phone bills. This is an unusual benefit and a nice perk for cardholders who frequently need to replace their phones. Why get the Cash Wise Visa Card? You want a simple, hassle-free rewards card that awards a flat cash back rate on purchases. You’re looking for a cash back card with a large sign-up bonus. You want to supplement your rewards earnings on other cards with a bonus on general purchases. You already have a bank account with Wells Fargo and prefer a card with the same bank. You have excellent credit and are looking for a strong cash back card. Use your card for any purchases that don’t earn a higher bonus on another card. Earn a higher rewards rate by using your phone to make payments instead of your card. Repay your purchases in full each month in order to avoid paying interest.